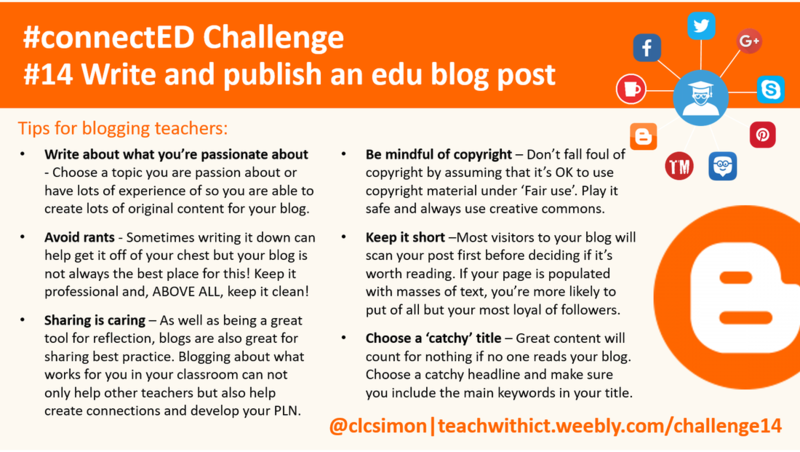 Challenge 14: ​Write an edu blog. Writing your own blog can be a great tool reflection but also a great way to connect with other educators. When I first started blogging, I didn’t think anyone would be interested in what I had to say. For me, it seemed the perfect medium to chronicle my first year of teaching Computer Science. So, as you can imagine, I was surprised when people started to post comments on my blog saying how they had enjoyed my post or how they had used my resources in their lessons. But, for me, the biggest surprise was the connections I made as a result of my blogging, in particular, other Digital Leader evangelists such as the amazing Mark Anderson (http://ictevangelist.com/), Sheli Blackburn (http://carryonlearning.blogspot.co.uk/) and Chris Sharples (http://www.gr8ict.com/) - to name but as few. Don't want the hassle of setting up/maintaining your own website/blog? Use websites like the Staffrm (See Challenge 18: Write a staffrm blog post) to publish your posts for free. Write about what you’re passionate about - Choose a topic you are passion about or have lots of experience of so you are able to create lots of original content for your blog. Avoid rants - Sometimes writing it down can help get it off of your chest but your blog is not always the best place for this! Keep it professional and, ABOVE ALL, keep it clean! Sharing is caring – For me, the primary purpose of blogging is to be reflective however, as well as being a great tool for reflective practice, blogs are also great for sharing what works in the classroom! Blogging about what works for you in your classroom can not only help other teachers but also help create connections and develop your PLN. Keep it short – With time being so precious, even more so for teachers, it should be of no surprise to you to hear that most visitors to your blog will scan your post first before deciding if it’s worth reading. If your page is populated with masses of text, you’re more likely to put of all but your most loyal of followers. Keep it short and keep it concise. Be mindful of copyright - Many teachers fall foul of copyright by assuming that it’s OK to use copyright material under the ‘Fair use’ policy. Do not assume that the rules of fair or educational use automatically apply to all copyrighted content. The best way, I find, to be sure that you are not in breach of copyright law is to use creative commons. Choose a catchy title. – No matter how great your content is, this will count for nothing if no one ever reads your blog. If you want to drive more traffic to your blog, choose a catchy headline and make sure you include the main keywords in your title. Be social – Most free hosting services such as weebly and edublogs allow you to connect your blog to your Twitter or Facebook account. By doing this, every time you publish a new post everyone who follows you will be notified. Submit your blog to the major search engines – One way to get traffic to your blog is to submit it to all the major search engines. Most free education hosting services such as weebly, automatically submit your site to the most popular search engines however, you can also submit your blog yourself. Submitting your blog is absolutely free however, don’t expect to be listed straight away, some sites will take months to index or crawl your website and add it to their listings. Exchanging links - Partnering up with other similar blogs and exchanging links is another way to send traffic to your blog – it’s also a great way to connect with other educators! Essentially, you place a link to someone else’s website on your own site and they do the same for you. Add a “Recommend This Site” or “Add This” link - Adding a "Recommend This Site" or “Add This” to your website using tools such www.addthis.com/ can help improve your blog traffic. If someone visits your blog and knows of someone else who may appreciate it, they can use this feature to e-mail the page's link to a recipient or share the link via social networking sites such as Facebook and Twitter. http://ictevangelist.com/i-worry-about-teachers-who-blog/ - Guidance for teachers who blog. Tags: blogger, blog design, free blog posting sites, blog posting sites, blog posting websites, where to post blogs for free, best blog websites, best blogs, best website for blogging, web page creator.